With Sonic Mania being released for about a month it's time for Sonic fans to turn their attention to the upcoming Sonic Forces game. The 2017's modern installment in the iconic Sonic series. 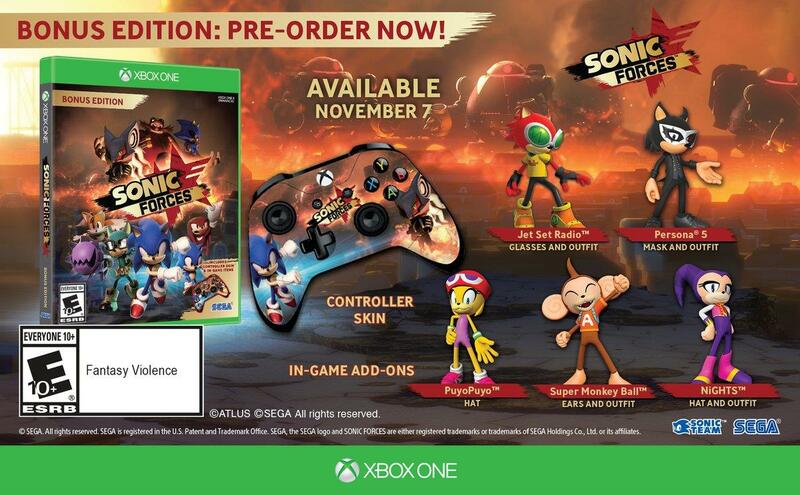 Sonic Forces has been dated for November and retail pre-order customers can get an exclusive Bonus Edition that has some extra goodies. However digital exclusives have yet to be announced. We will get back to that. The Bonus Edition includes a controller skin for your specific platform and in-game cosmetics from a variety of other games like Jet set radio, Super Monkey Ball, and Persona 5. You can catch a glimpse of these in the picture above. Available for a limited time only, the Bonus Edition will contain four Sonic Forces art cards and the SEGA/ATLUS PACK add-on, which offers 13 more in-game outfit items and accessories to recreate the look of five other SEGA/ATLUS icons for your Hero Character. Those who pre-order the Bonus Edition from retailers participating in the pre-order scheme will also receive the Shadow Costume for their Hero Character. The physical editions are already showing up for pre-order at various retailers for US$39.99 (so no $60 price tag). According to SEGA, digital editions will be announced at a later date. Sonic Forces will spin dash to our consoles on November 7th.